You might think the title of “worst animated movie in history” may belong to some obscure feature from animation’s early years. Perhaps an odd cartoon experiment from a time before artists fine-tuned the craft, that maybe had a limited budget that prevented it from achieving standard production values. But you’d be wrong. The film most widely considered to be the worst animated film in history had a multi-million dollar budget, and was released in 2012. The title of this straight-to-DVD abomination is Food Fight!, and its repugnant reputation is well-earned. Food Fight! is the worst animated feature I have ever seen. I safely make such a claim without the slightest bit of hesitation or hyperbole. I have never seen an animated film that even begins to approach its ineptitude, annoyance, and flat-out ugliness. After having watched Food Fight!, I now have a finer appreciation for The Nut Job and Norm of the North. Food Fight! makes even those awful movies look good by comparison. Yes, Food Fight! is that bad. Food Fight! had a notorious production history. It was originally intended for theaters – heaven forbid – and slated for release in 2003. Reportedly, the hard drives containing a number of the film’s original assets were stolen, leading the film’s production to be put on hold until 2004. The film was then to be redone with motion-capture and released in 2005, another release date it ended up missing. The production problems were so bad, in fact, that the filmmakers had trouble getting investments to afford the film’s budget…during its production. Through some ironic miracle, the film did manage to nab a few celebrities to provide the voice work (including Charlie Sheen, Wayne Brady, Eva Longoria, Hilary Duff, Edward Asner and even one of my favorite actors in Christopher Lloyd), but that must have been where all of the money went. Everything got so bad that the studio behind the film lost all faith in the filmmakers, and auctioned off the film’s assets in 2011, and the financing company backing the film invoked a clause in their contract that allowed the film to be finished as cheaply and quickly as possible, so that they might get something out of this fiasco after years of nothing. In doing so, they unleashed a great evil upon the world. By this point, it should go without saying that the production values of Food Fight! are virtually non-existent. 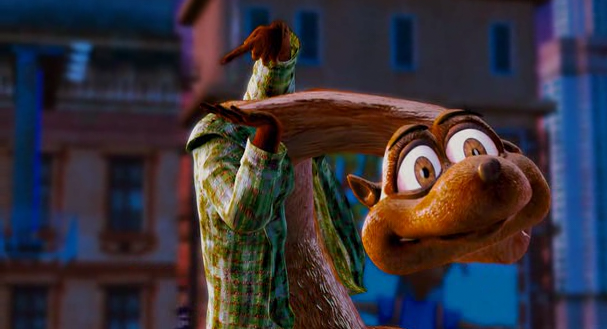 The animation – if it can rightfully be called that – is undoubtedly the ugliest I’ve ever seen. It looks sloppy, is blatantly unfinished, and the character designs are grotesque and nightmare-inducing. I can’t imagine a kid (supposedly the film’s target audience) could watch even a couple of minutes of this movie without being frightened. It’s equally as uncomfortable to look at for adults. The awful aesthetics don’t stop with the barf-like visuals, as even the audio sounds unfinished. I am not even joking when I say there are obvious inconsistencies with the audio quality, with the volumes of characters’ voices frequently fluctuating and – I kid you not – audible static being heard behind much of the dialogue. I would not be the slightest bit surprised if much of the voice work of the film were comprised of unedited test recordings from the actors. Goodness, I’ve only touched on the technical aspects of the film thus far. But I’ve delayed the inevitable long enough. The sad truth is, even if the production values boasted even the tiniest shred of not-sucking, Food Fight! would still be utterly abysmal due to its insultingly bad story and narrative structure. The story of Food Fight! is located in a supermarket called “Marketopolis Supermarket.” During closing hours, the store turns into a city, and the brand named mascots of the store’s food products (called “Ikes,” which is short for “icon,” though the film fails to ever explain that) come to life. Now, a supermarket equivalent of Toy Story already sounds insulting to Toy Story. But the whole setup is all the worse by how cryptic and nondescript it all is. Food Fight! constantly fails to explain any of the details of its world (does the market actually turn into a city, or does it exist in its own kind of “inside universe” like the video game worlds of Wreck-It Ralph? ), and it even seems to contradict its own rules (sometimes the Ikes can interact in the human world during opening hours, other times they just view the world through the logos on their respective items in the store). If I could give out an award to the worst world-building I’ve ever seen, hands down it would go to Food Fight!. 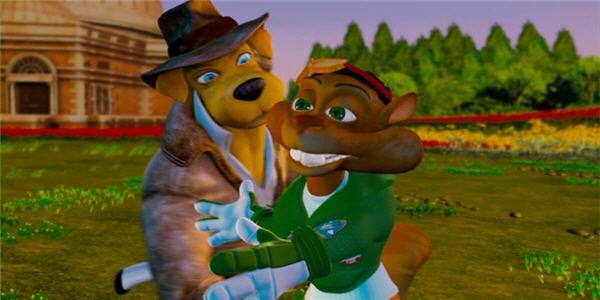 The main character in the film is Dex Dogtective (Sheen), a dog detective who also owns a nightclub. His best pal and supposed comic relief is Daredevil Dan (Brady), a chocolate squirrel who has an affinity for crashing his plane. 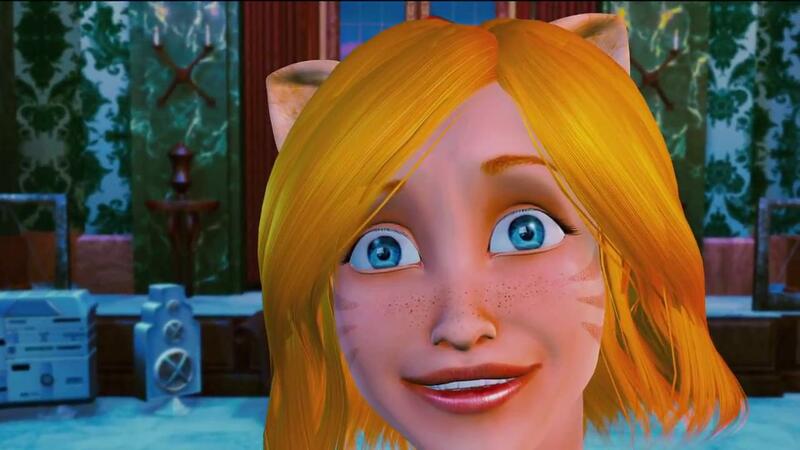 And Dex’s girlfriend is a girl with cat ears named Sunshine Goodness (Duff). Basically, Sunshine Goodness goes missing just before Dex gets the chance to propose to her. Six months later, in the real world, a representative for a product known as Brand X called “Mr. Clipboard” (Lloyd) pushes Brand X’s products into Marketopolis, to the dismay of the store’s owner, Leonard (Asner). The Brand X Ikes, lead by the mysterious Lady X (Longoria), then begin a hostile takeover of the store, which culminates in a massive food fight (har har) that takes up the third half hour of the movie (most of which is built around recycling the same shot and animation sequence over and over). Look, it’s just terrible. And in case the plot itself weren’t poorly thought-out enough, the pace of the film displays the troubled production as much as anything else in the movie. Once again, many of the aspects of the story are not explained to the audience, and you can’t help but think that a number of key scenes and expositions were left out of the final film. Many of the scenes of the movie just kind of happen, and several plot elements are dived into rapidly and suddenly, before they’re seemingly forgotten. I’ve probably described this movie as “unfinished” a number of times already, but it’s just an appropriate word when describing Food Fight!. There’s just so much missing from it that it’s jarring. I could go on and on about all the things wrong with Food Fight!. It’s even filled with sexual innuendos that are pretty inappropriate for a movie aimed at kids (Daredevil Dan hits on Lady X with the line “I melt in your mouth, not in your hand.” which is…eww). I honestly don’t have anything even remotely good to say about it. Food Fight! is simply irredeemably bad. I’ve seen some terrible animated features in my day, but wow, Food Fight! easily outdoes them all in the “bad movies” department. From its atrocious animation, phoned-in voice work, non-existent world-building, forgettable characters, inappropriate humor, sloppy pacing, bad writing, and all-around stupidity, Food Fight! is undoubtedly the worst animated film I have ever seen. Oh my! How does this animated film even exist? That Cheasel character is the stuff of nightmares.